M. Special Car Armoring - MSCA was founded with the main objective of producing the finest quality and most technologically advanced armored passenger vehicles in the world, reducing threats and helping protect its high-end clientele. The Management at MSCA is strongly committed to Quality and continuous improvement in all areas of the company. We thrive to work with competent employees and qualified experts to meet the Quality Management System requirements stated in Standard ISO 9001 and to continually improve the company’s processes so to insure that the company’s goals for quality, luxury, efficiency and customer satisfaction are always met. MSCA’s strategic objective is to remain committed; insuring and always improving the quality, engineering systems and processes, in order to consistently abide by statutory and regulatory laws and meet customer requirements and internal managerial needs and standards. 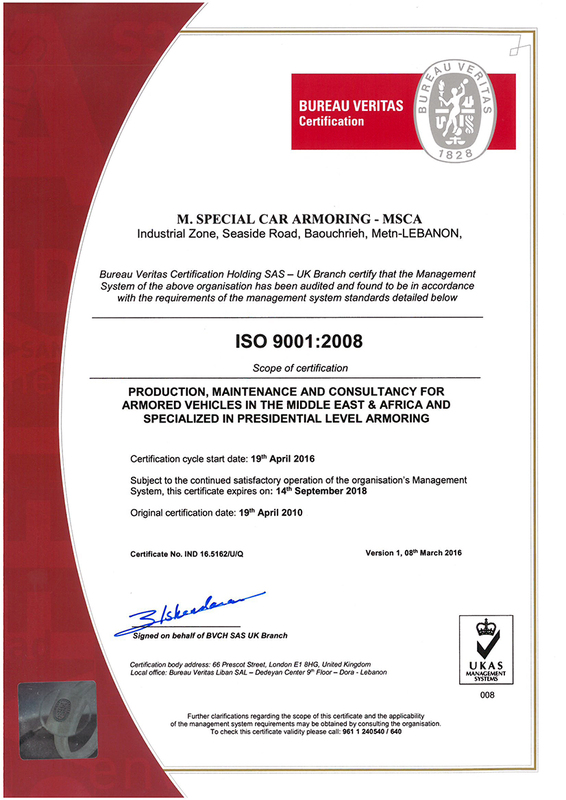 MSCA is ISO 9001:2008 certified by Bureau Veritas in the "Production, Maintenance and Consultancy for Armored Vehicles in the Middle East & Africa and Specialized in Presidential Level Armoring". Under observance of the aforementioned, customer satisfaction, quality armored vehicles and high personal security are MSCA’s main priority.